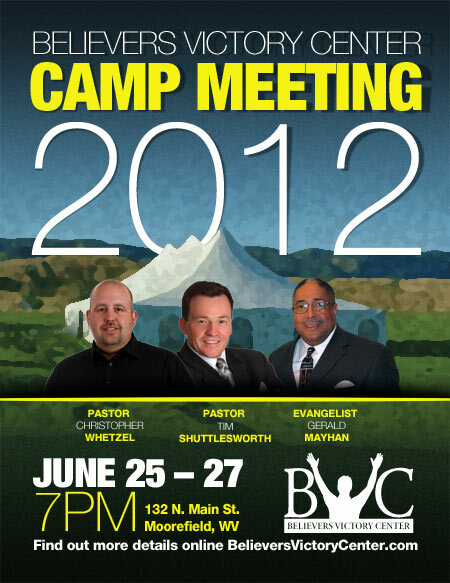 Just a reminder that BVC Campmeeting 2012 kicks off next Monday night (6/25) at 7:00 p.m. Gerald Mayhan is the speaker for the opening night and the BVC Praise Team will be on hand to lead us in some awesome praise. The event will take place in the field behind the BVC building, just look for the big tent! Also, to make Camp Meeting 2012 an event the entire family could enjoy, our Children’s Department is pleased to offer a three night Kid’s Crusade that will begin and end in unison with the outdoor Camp Meeting. The Kid’s Crusade will take place in the church building and will offer an array of high energy activities, age appropriate Bible lessons, and plenty of fun for children 5th grade and under. 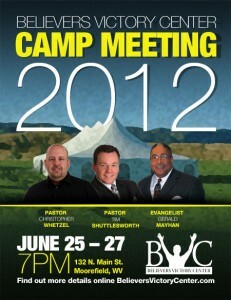 Camp Meeting 2012 is going to be a great time for everyone, so make plans to be with us each night, June 25-27 at 7:00 p.m.